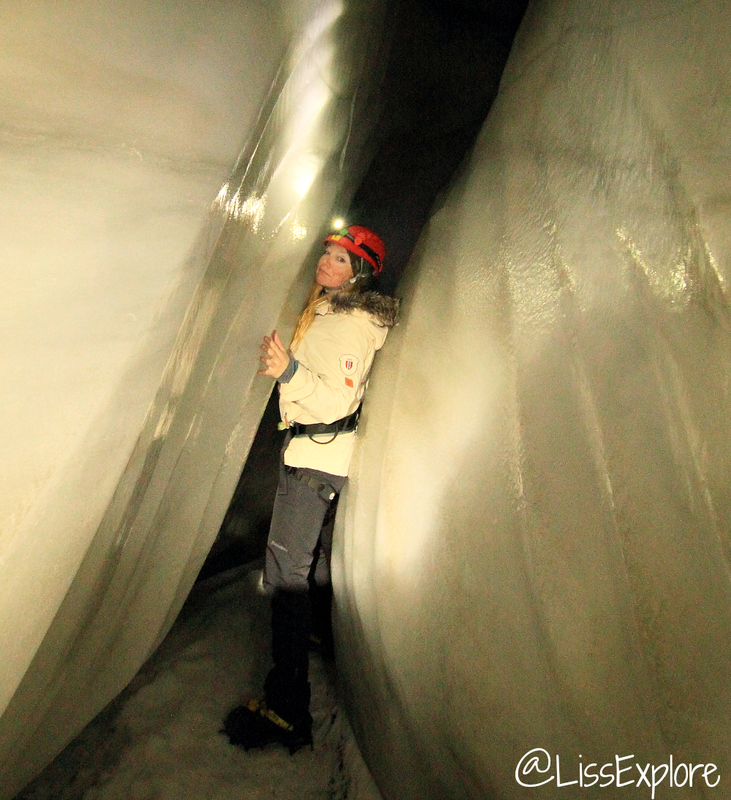 So, the main goal for my quick trip to Svalbard was to do a frozen ice climb in the dark ice caves inside Larsbreen glacier. Fortunately I met an adventure-seeking soldier/NY policeman to join me so we could do this together with our Italian climbing guide. You should not go outside the safety zones of the town Longyearbyen due to the risk of meeting an ice bear, so our guide also brought his shotgun for protection, which is standard equipment when moving around on Svalbard. 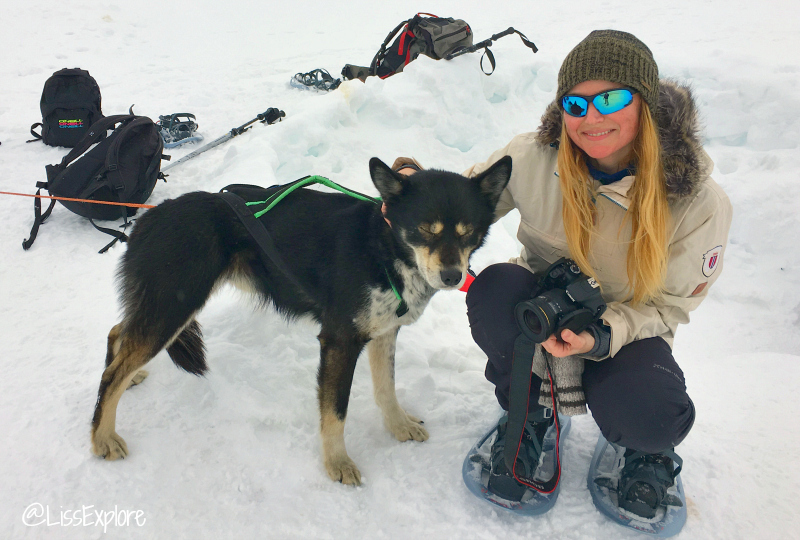 This cosy dog was patiently waiting for his master outside the ice caves entrance – and of course I wanted to give him a big hug and cuddle before crawling down into the caves – away from the wind and falling snow – and into the silence. We walked with snow shoes from our stay at Nybyen – and it mostly went steep upwards for about 90 minutes in moderate wind. Up there we prepared to go down into a narrow hole in the snow. After descending down a passage and a rope ladder we reached a wider area to sit down to arrange our gear and have some warm lunch. It was an amazing feeling to be totally surrounded by this frozen, glittering ice world with ice crystals, icicles, ice formations – frozen art work wherever you turn your head – what an absolutely brilliant place to ice climb! With helmets, headlights, crampon’s and harness on we walked/wriggled along the ice passages/meltwater channels to the first descent. We rappelled down about 4-5 meters, and continued walking/wriggle slightly downwards to the next rappel which is a 15 vertical meters deep moulin. It was indeed a very special feeling forme to go backwards down into the dark …alone.. (I could not help getting a flash from that scary movie “The Descent” while waiting down at the bottom by myself ..moaahhaa). Our skilled Italian climbing guide rappelling down the moulin – I knew I was in good hands from the very start. Well down (and in one piece) at the bottom we also tried to crawl under a crack under the glacier, but the glacier had moved a lil’ bit, so it was no longer possible to crawl through there as before. 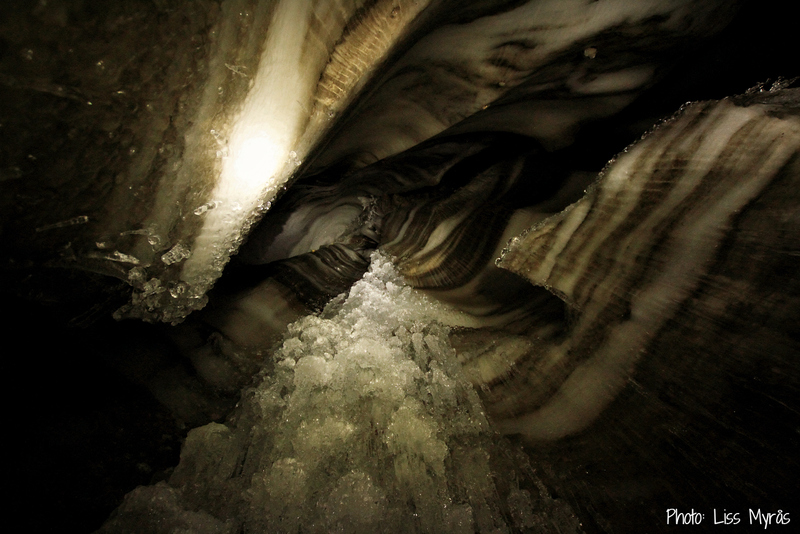 I cant’ say that I was too sad about not having tons of ice pressing over my body against the underlying rocks. I already had plenty of stars in my eyes from all these perfect natural formations surrounding us while climbing – thrill enough for me I’d say. 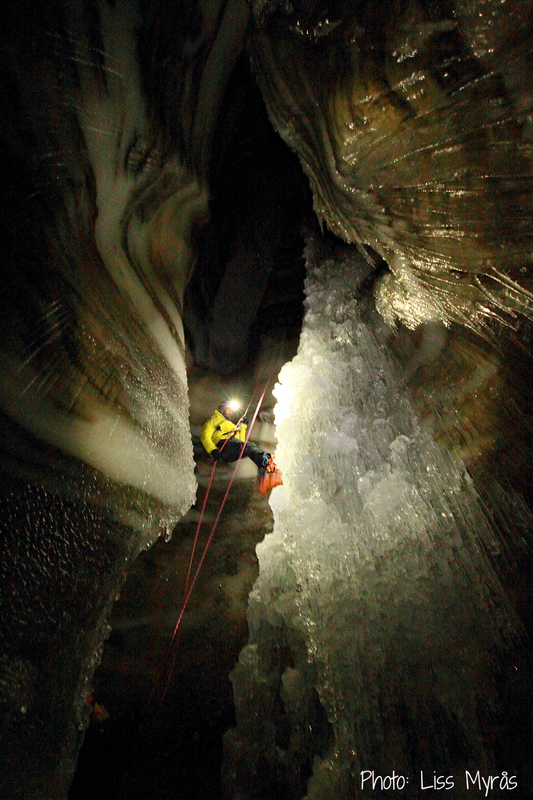 It’s narrow here and there inside the ice caves/meltwater channels – but when busy climbing and photographing you get used to it pretty quick – you have to if you want to go deeper! 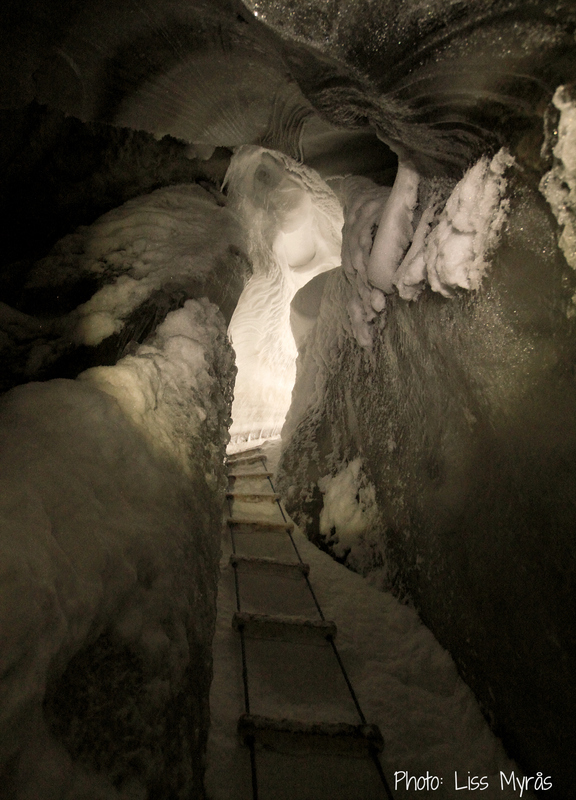 Then we climbed up again – and the 15 meter ice wall moulin was certainly much harder work to ascend – but so goddamn FUN! So the very next shorter climb was just like a “piece of cake” now – and perfect for training for a better ice climbing technique. 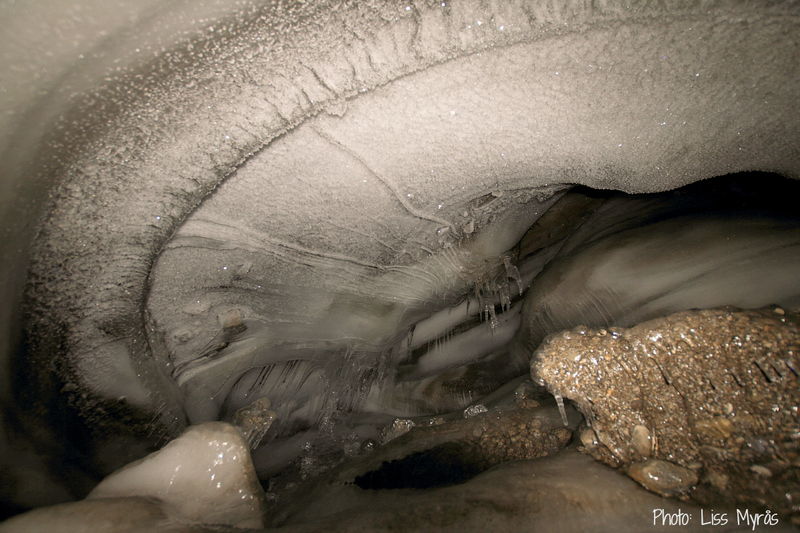 These frozen meltwater channels have created soo much twist & turns and beauty to grasp – I would need a new visit to concentrate on just photographing! Larsbreen are “slow-moving” glacier, but still no one knows how the channels will look like next year as they tend to change form due to the melting water every summer when the ablation is at it’s highest. Would be interesting to visit again later to see what has changed. Do behave in fragile places like this. Don’t vandalise the caves i ex with your ice axes (only use them where the climbing places are). Hi Liss! I am by no means a cold weather lover. I like different seasons, true enough, but given the choice, I almost always want to go somewhere warmer rather than colder. But you make this look sooo fantastically appealing. What a phenomenal adventure! Thanks for sharing! your blog and what you are doing!